The 24m King Ezana's stele in Northern Stelae Park, the biggest stele still standing. Aksum (also spelled Axum or Aksoum) is the name of a powerful urban Iron Age Kingdom in Ethiopia that flourished between the first century BC and the 7th/8th centuries AD. The Aksum kingdom is sometimes known as the Axumite civilization. The Axumite civilization was a Coptic pre-Christian state in Ethiopia, from about AD 100-800. The Axumites were known for massive stone stelae, copper coinage, and the importance of their large, influential port on the Red Sea, Aksum. Aksum was an extensive state, with a farming economy, and deeply involved in trade by the first century AD with the Roman empire. After Meroe shut down, Aksum controlled trading between Arabia and Sudan, including goods such as ivory, skins, and manufactured luxury goods. Axumite architecture is a blend of Ethiopian and South Arabian cultural elements. The modern city of Aksum is located in the northeastern portion of what is now the central Tigray in northern Ethiopia, on the horn of Africa. It lies high on a plateau 2200 m (7200 ft) above sea level, and in its heyday, its region of influence included both sides of the Red Sea. An early text shows that trade on the Red Sea coast was active as early as the 1st century BC. During the first century AD, Aksum began a rapid rise to prominence, trading its agricultural resources and its gold and ivory through the port of Adulis into the Red Sea trade network and thence to the Roman Empire. Trade through Adulis connected eastward to India as well, providing Aksum and its rulers a profitable connection between Rome and the east. The earliest monumental architecture indicating the beginnings of the polity of Aksum has been identified at Bieta Giyorgis hill, near Aksum, beginning about 400 BC (the Proto-Aksumite period). There, archaeologists have also found elite tombs and some administrative artifacts. The settlement pattern also speaks to the societal complexity, with a large elite cemetery located on the hilltop, and small scattered settlements below. The first monumental building with semi-subterranean rectangular rooms is Ona Nagast, a building that continued in importance through the Early Aksumite period. Proto-Aksumite burials were simple pit graves covered with platforms and marked with pointed stones, pillars or flat slabs between 2-3 meters high. By the late proto-Aksumite period, the tombs were elaborated pit-graves, with more grave goods and stelae suggesting that a dominant lineage had taken control. These monoliths were 4-5 meters (13-16 feet) high, with a notch in the top. Evidence of the growing power of social elites is seen at Aksum and Matara by the first century BC, such as monumental elite architecture, elite tombs with monumental stele and royal thrones. Settlements during this period began to include towns, villages, and isolated hamlets. After Christianity was introduced ~350 AD, monasteries and churches were added to the settlement pattern, and full-fledged urbanism was in place by 1000 AD. By the 6th century AD, a stratified society was in place in Aksum, with an upper elite of kings and nobles, a lower elite of lower-status nobles and wealthy farmers, and ordinary people including farmers and craftsman. Palaces at Aksum were at their peak in size, and funerary monuments for the royal elite were quite elaborate. A royal cemetery was in use at Aksum, with rock-cut multi-chambered shaft tombs and pointed stelae. Some underground rock-cut tombs (hypogeum) were constructed with large multi-storied superstructures. Coins, stone and clay seals and pottery tokens were used. One reason we know what we do about Aksum is the importance placed on written documents by its rulers, particularly Ezana or Aezianas. The oldest securely dated manuscripts in Ethiopia are from the 6th and 7th centuries AD; but evidence for parchment paper (paper made from animal skins or leather, not the same as parchment paper used in modern cooking) production in the region dates to the 8th century BC, at the site of Seglamen in western Tigray. Phillipson (2013) suggests a scriptorium or scribal school may have been located here, with contacts between the region and the Nile Valley. During the early 4th century AD, Ezana spread his realm north and east, conquering the Nile Valley realm of Meroe and thus becoming ruler over part of both Asia and Africa. He constructed much of the monumental architecture of Aksum, including a reported 100 stone obelisks, the tallest of which weighed over 500 tons and loomed 30 m (100 ft) over the cemetery in which it stood. Ezana is also known for converting much of Ethiopia to Christianity, around 330 AD. Legend has it that the Ark of the Covenant containing the remnants of the 10 commandments of Moses was brought to Aksum, and Coptic monks have protected it ever since. Aksum flourished until the 6th century AD, maintaining its trade connections and a high literacy rate, minting its own coins, and building monumental architecture. With the rise of the Islamic civilization in the 7th century AD, the Arabic world redrew the map of Asia and excluded the Axumite civilization from its trade network; Aksum fell in importance. For the most part, the obelisks built by Ezana were destroyed; with one exception, which was looted in the 1930s by Benito Mussolini, and erected in Rome. 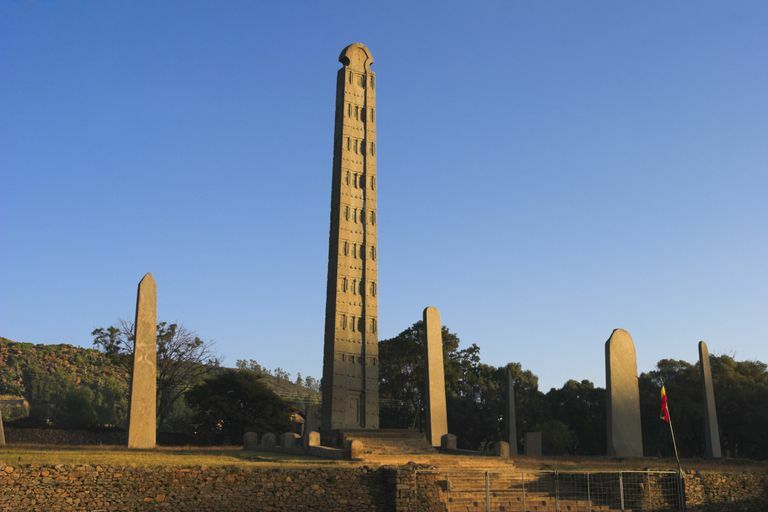 In late April 2005, Aksum's obelisk was returned to Ethiopia. Archaeological excavations at Aksum were first undertaken by Enno Littman in 1906 and concentrated on the monuments and the elite cemeteries. The British Institute in Eastern Africa excavated at Aksum beginning in the 1970s, under the direction of Neville Chittick and his student, Stuart Munro-Hay. More recently the Italian Archaeological Expedition at Aksum has been led by Rodolfo Fattovich of the University of Naples ‘L’Orientale’, finding several hundreds of new sites in the Aksum area. Fattovich R. 2009. Reconsidering Yeha, c. 800-400 BC. African Archaeological Review 26(4):275-290. Fattovich R. 2010. The Development of Ancient States in the Northern Horn of Africa, c. 3000 BC–AD 1000: An Archaeological Outline. Journal of World Prehistory 23(3):145-175. Fattovich R, Berhe H, Phillipson L, Sernicola L, Kribus B, Gaudiello M, and Barbarino M. 2010. Archaeological Expedition at Aksum (Ethiopia) of the University of Naples "L'Orientale" - 2010 Field Season: Seglamen. Naples: Università degli studi di Napoli L'Orientale. French C, Sulas F, and Petrie C. 2014. Expanding the research parameters of geoarchaeology: case studies from Aksum in Ethiopia and Haryana in India. Archaeological and Anthropological Sciences:1-14. Graniglia M, Ferrandino G, Palomba A, Sernicola L, Zollo G, D'Andrea A, Fattovich R, and Manzo A. 2015. Dynamics of the Settlement Pattern in the Aksum Area (800-400 BC): An ABM Preliminary Approach. In: Campana S, Scopigno R, Carpentiero G, and Cirillo M, editors. CAA 2015: Keep the Revolution Going. University of Siena Archaeopress Publishing Ltd. p 473-478. Phillipson, L. 2009 ]Lithic Artefacts as a Source of Cultural, Social and Economic Information: the evidence from Aksum, Ethiopia. African Archaeological Review 26:45-58. Phillipson L. 2013. Parchment Production in the First Millennium BC at Seglamen, Northern Ethiopia. African Archaeological Review 30(3):285-303. Yule P. 2013. A Late Antique Christian king from ?afar, southern Arabia. Antiquity 87(338):1124-1135.
Who Were the Eurasian Steppe Society Who First Settled Turpan?